A few notes: Want to win a $25 gift certificate to the Winnie & Walter shop? Leave some comments on the different stops along the blog hop route and you might be one of 3 random winners who receive one! A full list of the blog hop contributors can be found here on the Winnie & Walter blog. Let me just begin by singing the praises of the Lulu Fringe cutaway: I die. I'm in love. It's totally my new favorite thing. I got it because I've gotten a bit obsessed with making tassels and wanted to try my hand at paper ones using that die (and I did; I made a few; scroll down to the third card). But it's possibilities aren't limited to paper tassels and grass. I made this cute little banner, too, from some tassel scraps and I think it's pretty sweet. 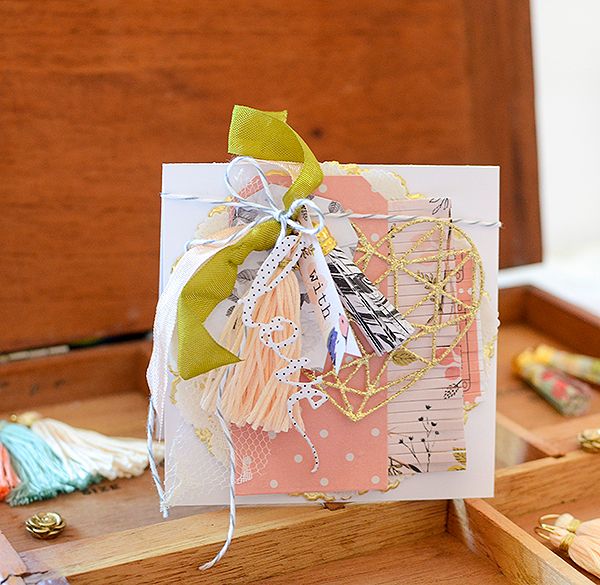 A few swatches of lace, tulle, and peach seam binding, mixed with imperfect hand stitching and warm-toned papers from Crate Paper and Pinkfresh Studio make for a darling mismatched garland. Since the fringed garland is the piece de resistance of this card, I wanted to keep the lower half simple yet still pretty. Two banners in coral and gold cut from The Big, The Bold, and The Extras cutaways, and a polka dotted "happy" are just enough to keep the lower half of the card from looking over the top, but with the mix of color, texture, and pattern, it's not unbalanced, either. Can you tell that I stamped a background on my next card?! I always buy the floral stamp sets, reeled in by the gorgeous images, and sold by the extraordinary examples the talented designers have created with them. Then I get them home and realize I can't do that. I mean, if I practiced and practiced and devoted an incredulous amount of my time to stamping, I think I could probably do it. But I'm not at that point yet so I was super-proud of myself for making this leaf background. It was a giant leap for me, number one, because I'm always too nervous to stamp directly onto my main surface (like the white card here), number two, because I eye-balled the whole pattern and didn't end up with any huge gaps or too-close clusters, and number three, I actually really like the way it turned out! Really, that bird tag is not covering up any errors; it's kind of a miracle. The leaf stamp is from The Big, The Bold, and The Extras stamp set and before you go thinking I stamped all over that bird tag, rest assured I didn't--it's paper from Maggie Holmes' new Gather collection. But isn't it such a compliment to my lovely leaf background? This is actually the first card I started and the last one I finished. It evolved a lot over the course of working on these projects. The very first things I made in preparation for WCMD were the paper tassels and I really wanted to use at least one on at least one card (all three cards at one time were adorned with a tassel, but, alas, they were not meant to be on the other 2). 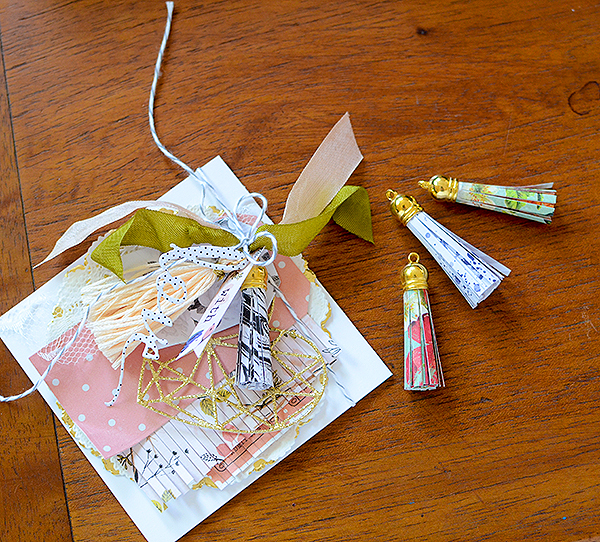 *Want to make your own paper tassels? I happened to have a small package of suede tassels with these gold caps on them. I pulled out the suede and replaced it with the paper fringe. There are similar caps here, sold on Amazon. I don't own them so do not know what kind of quality they are, therefore I'm not recommending them, but it's a good place for you to start searching! And I CAN endorse the Lulu Fringe cutaway because I have it, I love it, and it works! Anyhow, I'm not going to say which embellishments make this card slightly outrageous because I love each one of them dearly and while I was laying everything out, before anything was glued into place, it all looked just fine. So I'll just go ahead and blame the glue. 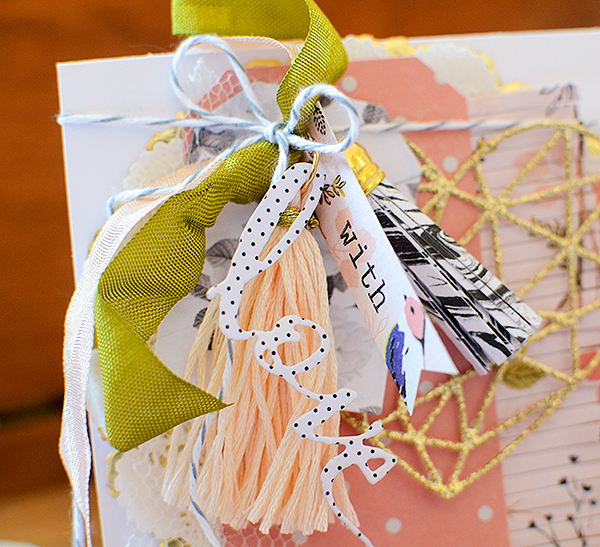 There are more fringe-y layers and Katharine tags, plus some "Happy" love, and even a gold, glittery Faceted Heart. And, of course, the paper tassel (made with the Lulu Fringe cutaway and a marbled patterned paper, again from Maggie Holmes' Gather). 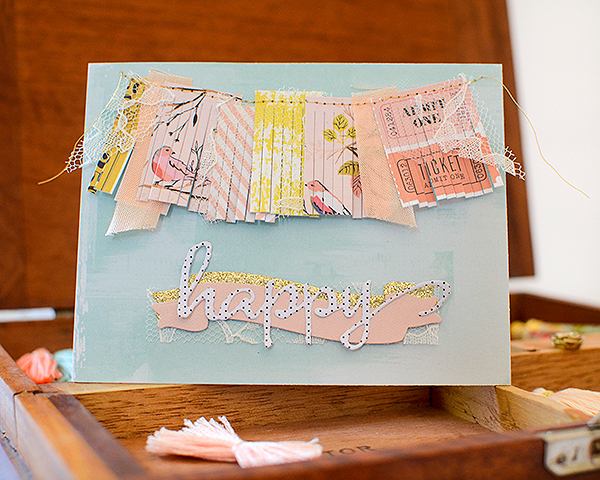 That does it for me on this World Card Making Day blog hop with Winnie & Walter. You're moving onto Kate now and don't forget to comment to receive $25 in the W&W shop! Thanks for stopping by! AMAZING projects! Love the colors!! Oh my. I have a fringe die and have not used it yet! You have inspired me! Your technique is so cool. You have created multi-media cards. Just beautiful. I need to stop by here more often! My CAS heart is swooning at the loveliness of all your goodies on your cards. Yet they remain light and playful and oh-so-fun! TFS. Those are fabulous, so creative and clever. I love the tassels. What alot of detail! I love them all! This is very unique and very pretty! I love the pastel colors! Such lovely, feminine cards! Happy WCMD! 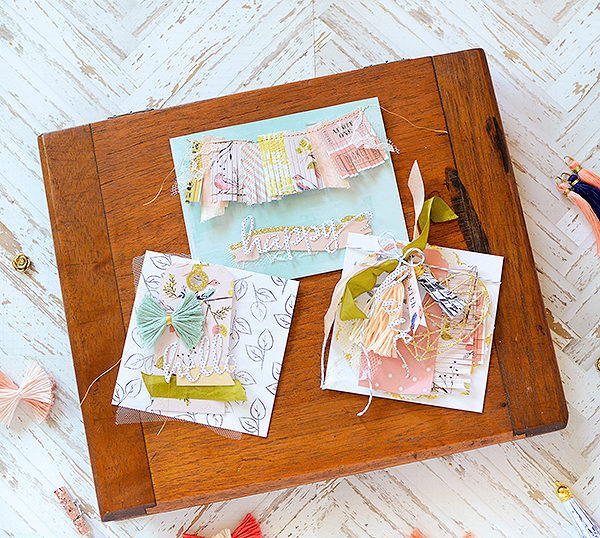 I love your collage style cards--what great inspiration. You obviously had a lot of fun making these very creative cards! Love the black and white background on the card with the bird. Lovely card. Unique is the word that comes to mind when I first glanced at your cards. Such a creative style. Lovely. Very cute cards. Love them all. 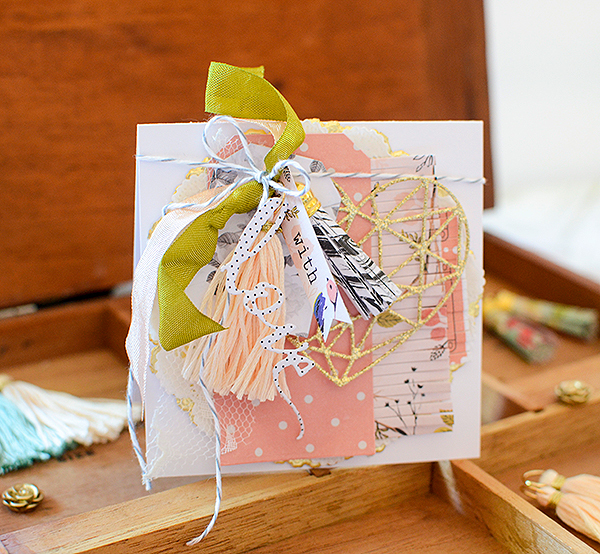 I've not seen that many cards like this with all the different textures & embellishments..they are just beautiful!! 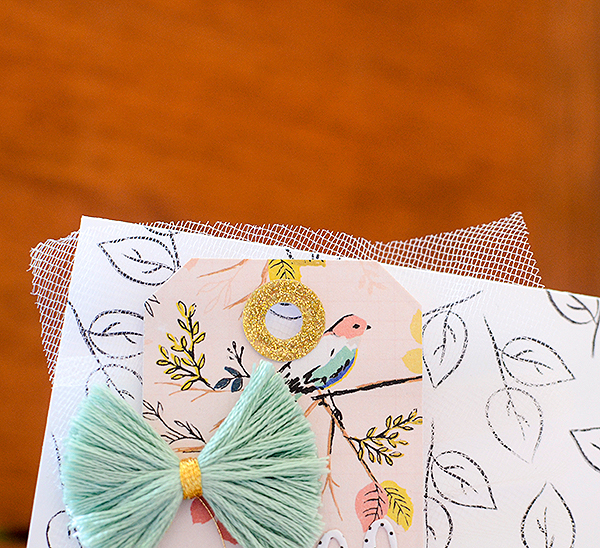 Love the soft colors you used, and of course...now I want that fringe die badly!! Absolutely gorgeous! I love all the different elements and embellies. These are my favorite color combos, so soft and dainty. I love the sewn details, your making me want to buy a sewing machine, lol. I have the lulu's fringe, love it. Thanks for sharing and inspiring. Wow very interesting mix of patterns texture and pretty colors ! Very beautiful and interesting cards. The mix of patterns and elements is so gorgeous! so many fun elements! happy WCMD! What great layering and backgrounds! Awesome cards with so much lovely detail! LOVE, LOVE, LOVE these adorable and beautiful little collages. All your details are spectacular. 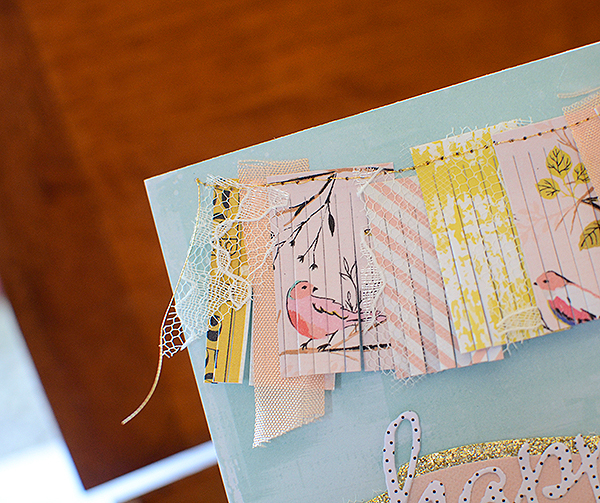 Your paper crafting is superb - I especially loved the bird banner with the fringe look. 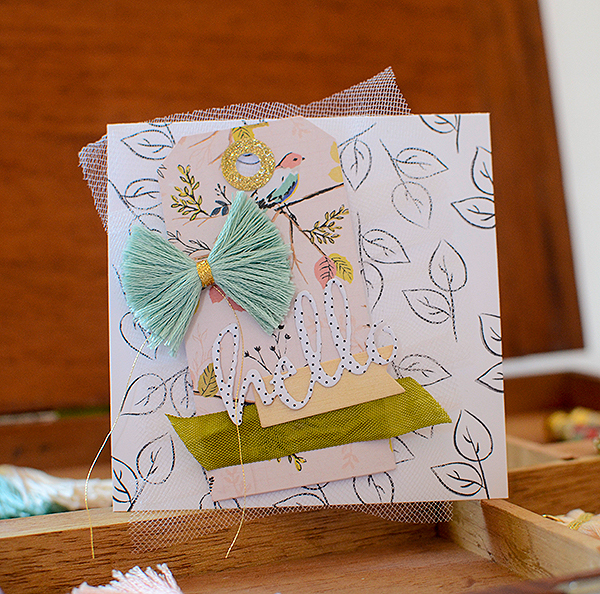 Beautiful soft colors and gorgeous cards! Love the sewn banner! Gorgeous creations!! Wow these are so adorable! Really love how all three cards reflect your great design style!!! Love the layers! Love all of your projects, amazing designs! Fabulous projects! Love all of the details!!! Wow, your cards are amazing with the layers and texture! The pennant banner at the top is just the coolest thing ever!!! Love these funky cards...they have so much flavor to them! Wow! These are beautiful cards! Love all the different elements you have used. Beautifully done! What an amazing array of cards!! Love the gathering of so many different elements - and such fab and funky cards!! had put some kind of a line through them. fantastic. I'll have to get this one. Making tassels will be easier too. Amazing work! I am never disappointed by your creativity! Wow, these cards are stunning. OMG...paper tassels! And I have those metal caps! Wonderful and so different. Love, love, love them! Thanks for sharing with us. These are so cute!! I love the mix of patterns and textures. Love the fringe and all the different elements to these. 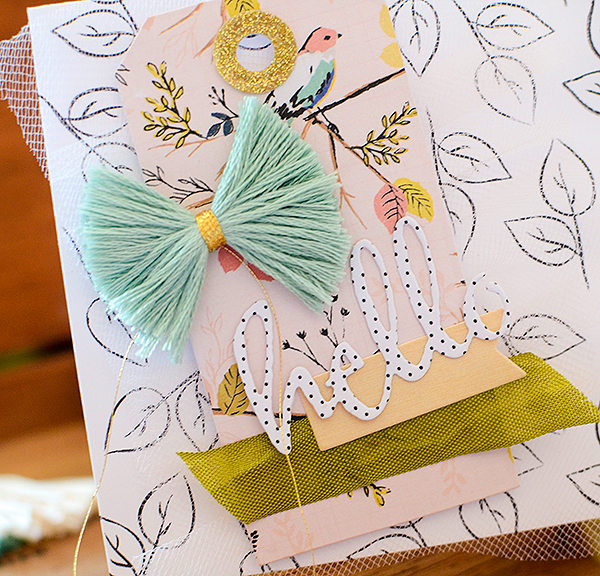 I'm in love with the fringe die look on your first card. What an out of the box idea. Very amazing and unique projects ! What a wonderful job ! The Lulu fringe Cutaway die looks so great ! Thanks for sharing. What pretty cards, Rebecca! I really love those tassels! Rebecca, What Great looking cards, sooo cool fringe and all looks like alot of work. Right uptown. WOW... great cards; so unique and inspiring! Really like your old fashion designs. I visited your blog for the first time and your work blows me away! This "fringe" look give a lot of effect - love it! Wonderful textures and dimension on these very unique cards. 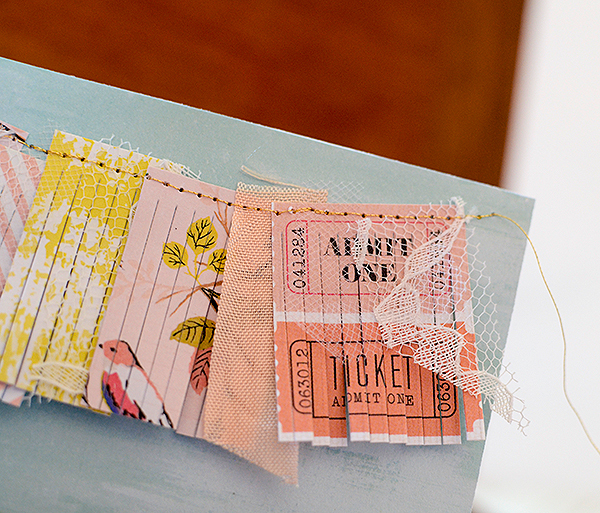 Beautiful cards, love all the textures especially the fringe! Wow! So unique and lovely! Thanks for sharing. 'AMAZING 'is the word for your work! 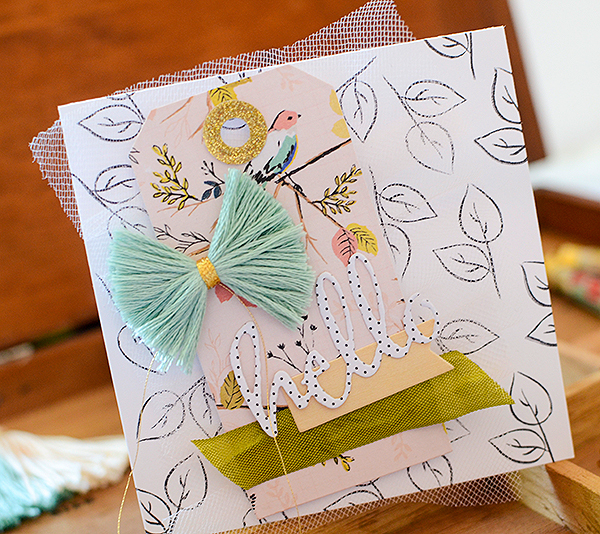 I love how beautifully you have used tassels and tulle for layering on your card. Love the pastel colours. Wow! So many fabulous cards! 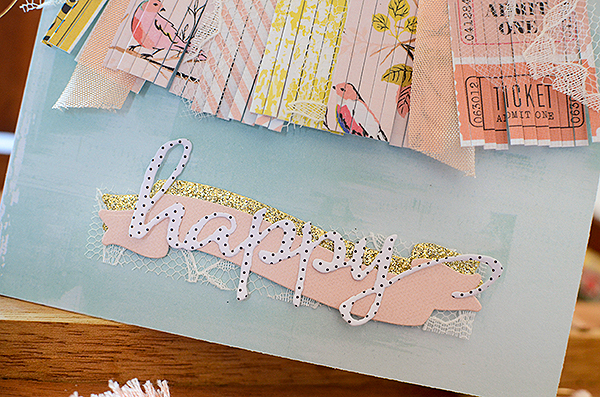 Love the fringey garland, your stamped background (I'm always hiding mistakes behind things - that's the only time I layer, so I'm in awe that you didn't need to!) and the 'hot mess' everything-but-the-kitchen-sink card! Such fun and unique creations!! Gorgeous cards! Love your unique style. Wow, your cards are just beautiful. Love all the lovely layers you created. LOVE your fringed garland and tassels, LOVE your pretty colours and layers too!!! Awesome textures and colors! Love these beautiful cards! Beautiful cards! Love the fringe!! Awesome work! Incredible! I'm in awe of how perfectly you mix so many elements. Such beautiful texture. I especially love the banner with the added lace. I’m late to the hop, but it’s a perfect day for doing so, as it’s gloomy and lightly snowing here. 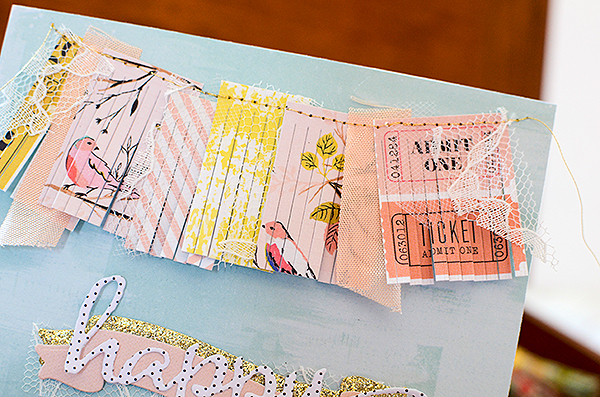 Nothing like awesome creativity to brighten my spirits, and your trio of cards, featuring fringes and garlands, as well as stunning colour/patterns, have certainly done so! Gorgeous!